Platelet rich plasma (PRP) is an injection therapy that uses healing factors in your own blood to aid in the regeneration and healing of injuries. Platelets are the property within blood that cause clotting in a wound, but they also play a role in the healing process. Because the injection uses the patient’s own blood, this is generally a safe, low-risk procedure in the hands of an experienced practitioner. 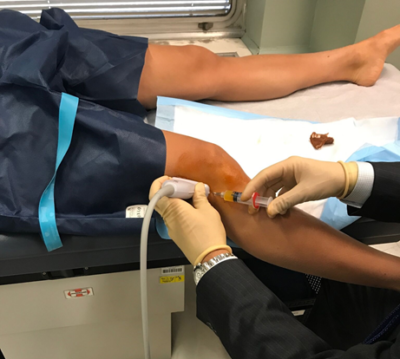 While there is currently much research into the efficacy of PRP for many injuries, PRP has been shown to hasten rehabilitation time for some injuries. PRP is a great option for chronic tendon inflammation and can be an option for injuries including ligament sprains, muscle strains, and arthritis. An ultrasound transducer is placed over the IT band. PRP injections can be done in an outpatient doctor’s. Blood is drawn from the patient’s arm and then placed in a centrifuge. A centrifuge is a laboratory device that spins and causes separation of fluids, liquids, and gases based on the density of the individual parts. In the case of PRP, the centrifuge separates red blood cells from platelets and plasma. The platelet and plasma mixture is then extracted into a separate syringe for injection. Ultrasound guidance is frequently used when the patient is being injected to confirm needle placement. 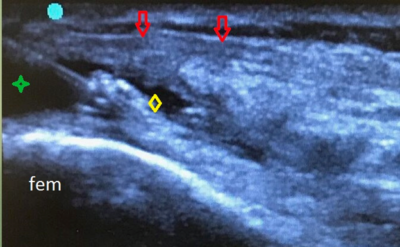 Ultrasound imaging confirming needle placement and PRP (yellow diamond) being injected into edema (green star) deep to the IT band (red arrow). PRP works best when used in conjunction with other modalities, such as physical therapy. Frequently PRP injections are administered in a series of 2–3 injections. Following the injection, there may be discomfort or soreness. This can be treated by icing or taking Tylenol. Who is eligible for a PRP injection? There is no minimum or maximum age for PRP therapy. PRP can be used to promote surgical healing, injuries that do not require surgery, and for chronic tendon issues. Are there any side effects associated with PRP therapy? Although uncommon, risks include those associated with an injection: pain, infection, no relief of symptoms, worsening symptoms, blood clot, nerve injury, skin discoloration, scarring, loss of fat to area, calcification, and allergic reaction. If you experience any of these symptoms, please call our office. You may require more than 1 injection. Usually, we recommend a series of 3 to achieve maximum benefit. After this, you will begin a course of physical therapy. Later in the day, you may experience soreness or discomfort. This is normal and can be treated by icing the area as needed and using Tylenol. You should not take anti-inflammatories (Advil, Aleve, Motrin, ibuprofen) for 48 hours following your injections. How much does the injection cost? Unfortunately, the PRP injection is not yet covered by insurance. You must pay the $900 fee at time of service.